Adam Bogdan has revealed he’d be interested in sealing a permanent move to Hibs. The Hungarian internationalist – on a season-long loan from Liverpool – has a produced a string of impressive performances to become first-choice goalkeeper at Easter Road. The 31-year-old’s contract is up at Anfield in May and the 20-times capped stopper has revealed he’d consider extending his stay in the Capital. Bogdan, who has made 13 appearances for Hibs this season, said: “Yes, of course, as Hibs is a very appealing club and Edinburgh is fantastic. 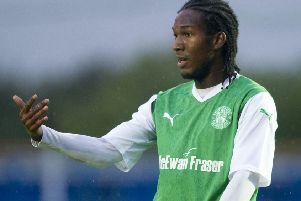 “I have a season-long loan at Easter Road, and I’m very happy in the city and at Hibs. “The support from the fans is great and the people at the club are fantastic. Bogdan, who joined Liverpool from Bolton in 2015 but made just six first-team appearances for the Reds, told the Scottish Sun: “I was out injured for a long time, so I want to enjoy what I’m doing and perform the best I can in every game.